I was contacted and asked if I would like to review some John Frieda products. 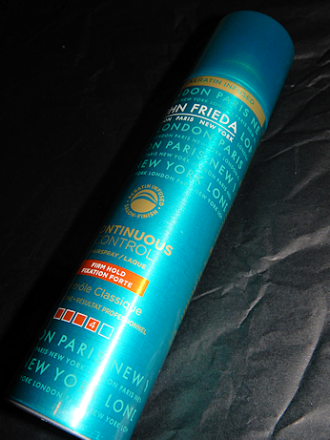 I have never used John Frieda products before but I knew how brilliant they were because people would tell me. I was extremely excited to get my products as I had no clue what I was getting as it was near enough a surprise. I opened the box immediately when I received it and I was shocked to what I was looking at the things I had been given were absolutely FANTASTIC! 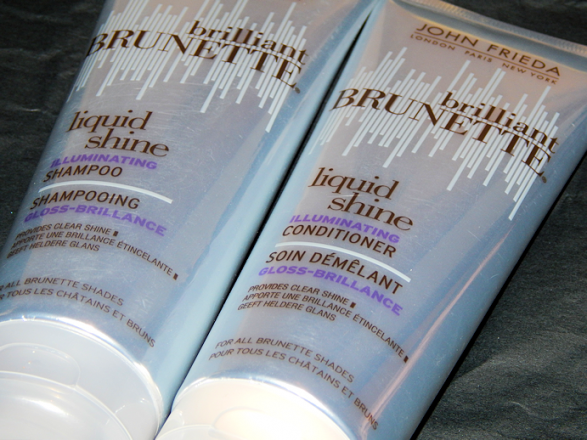 The first things I received were Brilliant Brunette Shampoo & Conditioner. 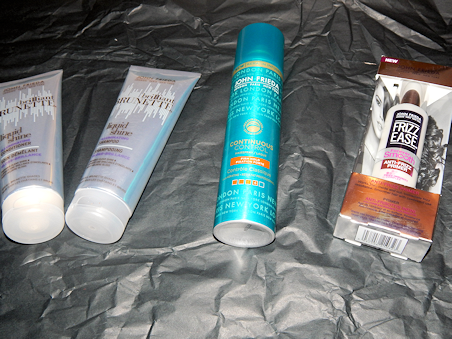 The second thing I received was Frizz Ease hair primer and Lastly I got John Frieda Hair Spray. I went for a shower that night to try 3 out of the 4 products. 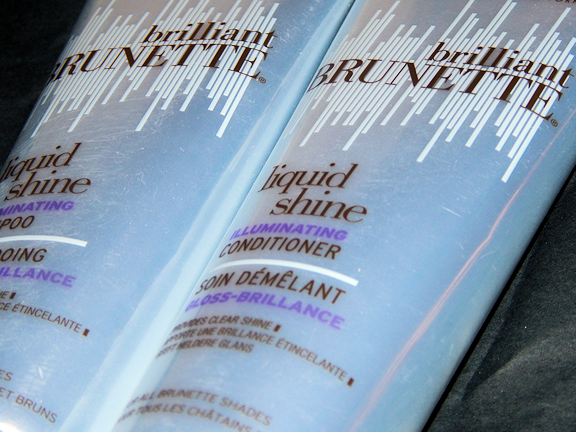 My shampoo and conditioner are from the ‘Brilliant Brunette’ range but they’re other shampoo’s and conditions in the range and for all types of hair so go take a look if you are looking for something particular. I struggle with my hair so much, no matter how much I brush it, wash it or try to sort it. It is always messy, ALWAYS knotty and always a really big handful. 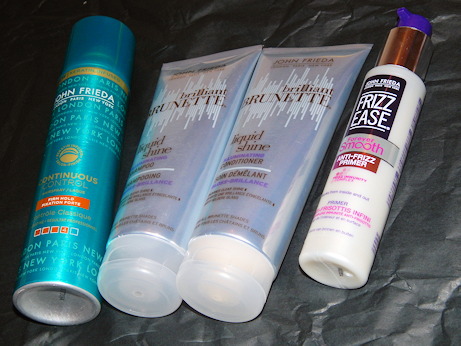 So I was hoping that these John Frieda products would help to tame my hair a little bit more. After washing my hair my hair tends to be worse because it is all tangled and does not really feel ‘soft’. So this is what I thought of the products. The shampoo’s packaging is a really nice Silver and has a see through flip cap. I like the design of this bottle because it stands on the flip cap which means the shampoo is really easy to dispense. When I open the flip cap and smell the shampoo the scent is so fresh and clean and quite like a perfume, but it smells incredible. The shampoo itself is a runny and clear consistency and it lathers up really well. All you need is a blob about the size of a 2 pence piece to massage into your head as a little goes a long way. After washing out the shampoo and before putting in the conditioner you can already feel that your hair is softer. I also noticed that my hair did not tangle up as much as it usually does after using shampoo and for a bonus it has not irritated my scalp. I often find that many shampoo’s irritate my scalp so I was extremely happy. The website says ‘Drench brunette hair with dazzling shine, for a high-octane glossy finish. Designed exclusively for brunettes, this light-reflecting shampoo is enriched with the unique Crystalline Complex, to deeply target and replenish damaged hair fibres, while polishing surface cuticles, for rich and vibrant brunette hues that shine on with multi-faceted opulence.’ I 100% agree with these statements. My hair is quite damaged at the moment after I bleached my hair a ton of times a year or so ago. My hair feels so much better after using this shampoo and my hair definitely has a shine to it. 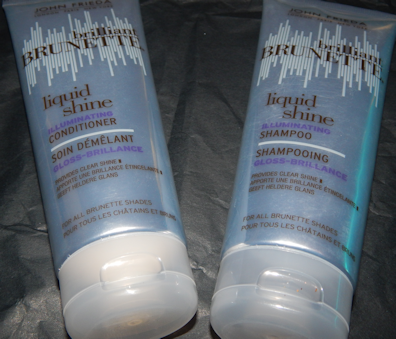 Like the shampoo the Conditioners packaging is Silver with a transparent flip cap. The scent of the conditioner is not as strong as the scent of the shampoo but the conditioner has a light coconut smell. The conditioner has a little thicker consistency and it is white with little tiny sparkles (although just in case you wondered you cannot see these in your hair). Again you need about a size of a two pence piece as a little goes a long way. As I was washing the conditioner out I do not ever think I have felt such smooth soft hair in all my life. My hair has never felt like that and it was such a lovely feeling. After getting out the shower and before styling I just brushed my hair and was so surprised at the fact the brush and a COMB yes a comb anyone who knows me knows how hard it is to get a normal comb through my hair. But anyway the comb went through and my hair was silky, soft and shiny and felt amazing. No knots, no matts and no tangles. I thing I loved the most is that fact my hair smelt amazing. It still smelt of the shampoo and conditioner and it smelt like I washed my hair all fresh and clean and I love the smell of clean and fresh, just like clean sheets. The website states ‘ Drench brunette hair with dazzling shine, for a high-octane glossy finish. Designed exclusively for brunettes, this light-reflecting conditioner is enriched with the unique Crystalline Complex, to deeply target and replenish damaged hair fibres, while polishing surface cuticles, for rich and vibrant brunette hues that shine on with multi-faceted opulence’. 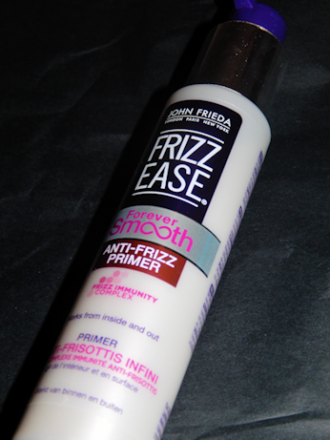 Before I dried and styled my hair I decided to use John Frieda Frizz Ease Forever Smooth Anti – Frizz Primer. Although at this point my hair is wet and not frizzy as soon as that hairdryer touches my hair and whilst my brushing it BOOM, frizzy hair. So anyway I thought I would try it and I really did not think I would get along with it at all, but I am really happy to say I was wrong. It 100% worked and my hair was not even frizzy. There is not a strong smell but it has a light smell to it. My hair was soft, smooth and shiny and Non Frizzy! I have used this a couple of times now and I can say the more I use it the more my hair is not frizzy any more. I love this product. The website says ‘Experience a new generation of innovative haircare and set the foundation for a long-lasting, frizz-resistant style. A revolution in frizz immunity is here.With ground-breaking Frizz Immunity Complex, this revolutionary leave-in Primer realigns the structure of your hair, strand by strand, to strengthen your hair’s immunity, for complete frizz elimination with every use.A targeted humidity-resistant blend of pure coconut oil and glycerides help to fight the onset of frizz from the inside out, to improve your hair’s texture and manageability, for noticeably smoother hair.The light-weight texture also absorbs quickly into wet hair to ensure a silky-smooth, weightless style with a natural softness, as your hair dries, while offering essential heat protection. Expertly designed for medium-thick and wavy-curly hair types, but suitable for all levels of frizzy hair types, including colour-treated hair.’ This worked like a treat in my hair. I definitely will be using this and re-purchasing it. After I had styled my hair I locked it all in with John Frieda hair spray. I do not usually get along with hairsprays, I usually put too much on and my hair goes stiff and hard and I hate that feeling. This was so different though. It does not have as much force when sprayed so not too much comes out and my hair was not stiff and hard. Infact my hair was still shiny and soft and my hair stayed in place for 13 hours just before I went to bed and I am sure it would last longer. It was absolutely amazing. I have been using this hair spray ever since and it has made me change my mind on all hair sprays now! well done John Frieda. I am very suprised it kept all my baby hairs in place and my hair still felt natural. The website states ‘Set your style in place for a sublime finish that lasts up to 72 hours. Enriched with replenishing keratin, the ultra-fine mist has been expertly formulated to firmly hold your style in place for a long-lasting, smooth finish. The non-sticky formula, infused with high humidity resistance, blocks frizz and tames flyaways to leave your hair feeling smooth with soft, natural movement, perfect for any occasion. Suitable for all hair types, including colour-treated hair. Overall the products I was sent were absolutely fantastic and I would definitely re-purchase them. 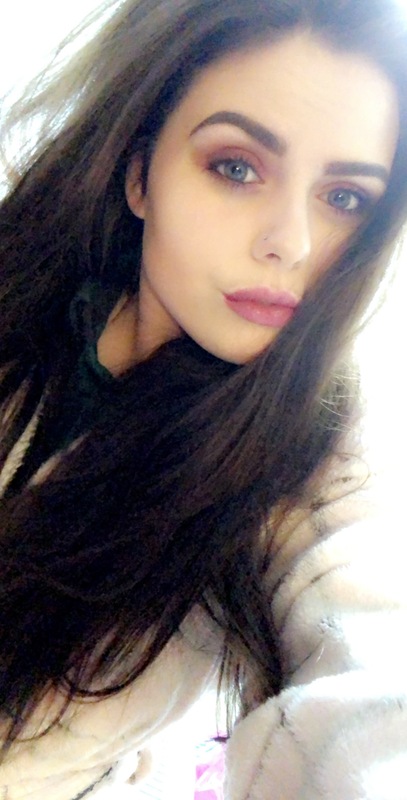 My hair feels better every time I use the products and I would like to try other products in the ranges too! I recommend anyone to go and try out some products in the ranges because it does your hair the world of good and you will be surprised.